Housed within a restored 17th century farmhouse, La Maison d�Ulysse elegantly blends contemporary and traditional design. The modern interiors exude style and comfort, creating a chic pied-a-terre in a natural and restful ambiance.Formerly the residence of the poet and archaeologist, Ulysee Dumas, La Maison d Ulysse, this historical hotel is set amidst Mediterranean gardens with simply gorgeous countryside views from every from every vantage point. The solar heated pool is a welcome retreat on a hot summers day and there are lots of quite spaces to sit and relax in this stunning setting. 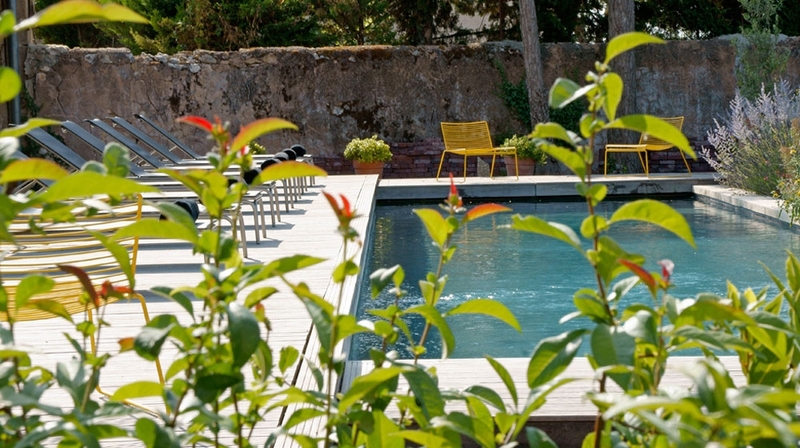 The doting hosts, Guy and Gauthier will make guests truly welcome and delight in organising day trips to Uzès, Nîmes and Avignon and on your return after a day of exploration, they will reward you with local wine and pre-arranged dinners in the pretty candlelit courtyard. 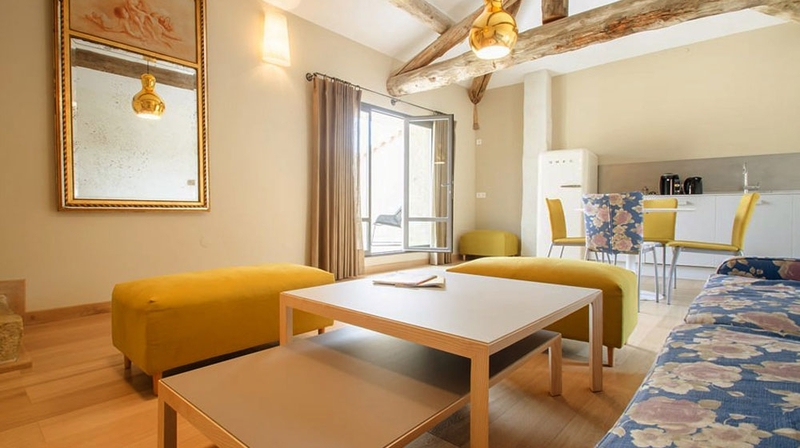 This is the perfect choice for those looking for a hip hideaway amongst outstanding French countryside. Nestled under the vaulted ceiling of the oldest part of the house, this king-size bedroom has a gentle, romantic feel with clean lines and understated furnishings. The ensuite bathroom has a walk-in shower. There�s an air-conditioning. The room is in the attic, at the top of a small tower. 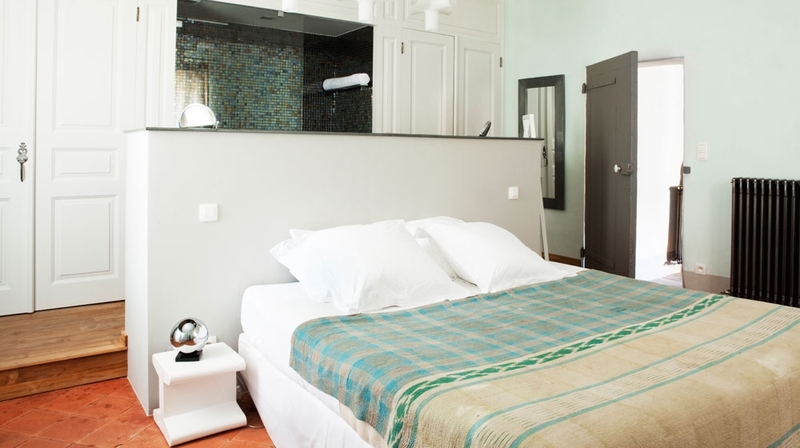 You will appreciate its coolness and its natural limewashed walls.It has a bathroom with a shower and a 180 x 200 cm bed. Its main advantage is the superb view that it offers of the garden, swimming pool and patio. Perched proudly at the top of the Maison d�Ulysse farmhouse, its elegance and coolness will enchant you. The room provides an excellent view for gazing overing of the garden , the patio and the sunset. 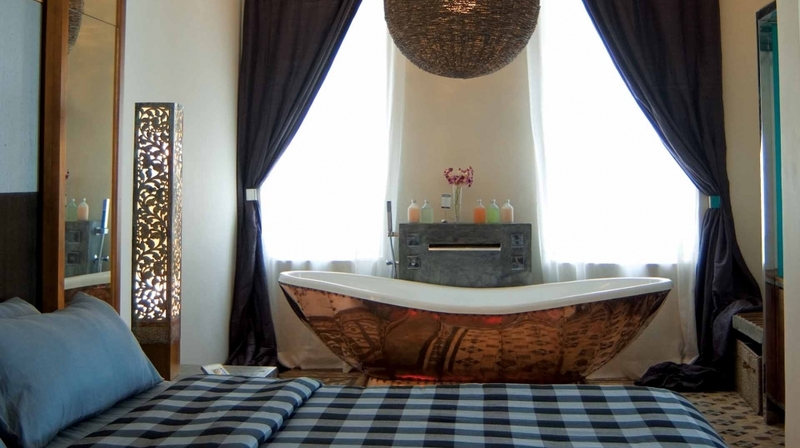 The bathrooms open-plan bathtub, is particularly attractive. 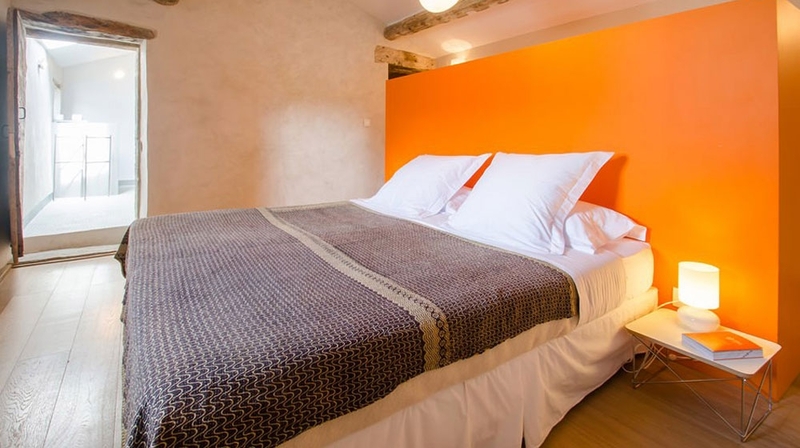 The Chant du Mûrier Suite is the most suitable room for young couples with babies and young children. Spacious and removed from other rooms. From its private terrace, you will enjoy a magnificent view over the countryside and the south side of the garden with its splendid mulberry tree. The suite includes a lounge and a bathroom with separate shower. 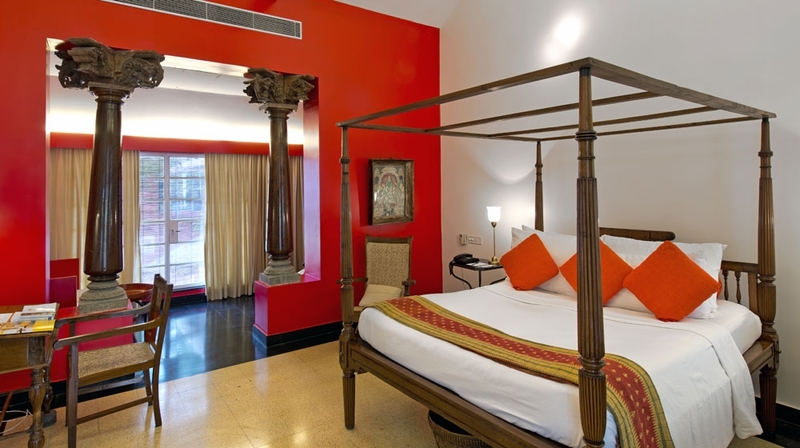 This room has an original tiled floor, a cute shaded private terrace with a daybed, and a bathroom with a claw-foot tub. Thius room has a unique 1930's atmosphere. The Belle du Seigneur suite is located in the oldest part of the house. You will find yourself in the heart of the property, with a private space of 60 m² at your disposal, including a lounge and a fireplace. This suite stands on the first floor of the house � open planned, this space is by far the most spectacular in the hotel. This large loft style suite is a real delight for all the senses. 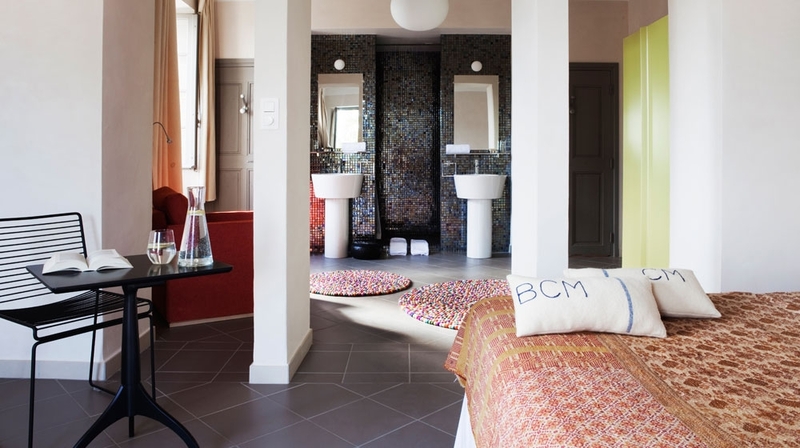 The sun blazes through each of the eleven little windows and the room has a separate WC, king size bed, vast lounge and a private balcony with beautiful un-interrupted views of the Provençale countryside. 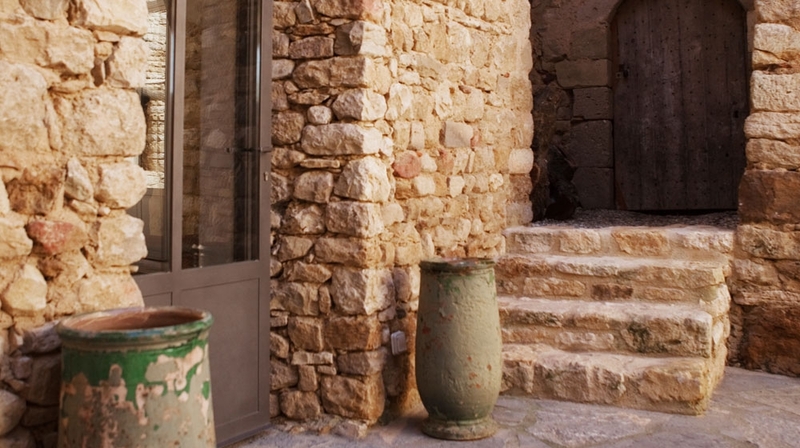 This suite has a genuine loft feel, with an exposed and dreamily restored stone wall complete with an ancient dove coup. The contemporary tiled floors add a simple fluidity to the room and enhance the majestic bathroom, the centre piece of the suite. Dressed with a large glass screen, this double walk in shower covered with the same tiles as the floor is at perfect harmony in its space. The suite is completed with its own dressing room and separate WC. The Provençal sunshine and light flood into the suite reflecting off of the mirrors and onto the cheerful bold colours of the furnishings. With a total area of 70m², the apartment �Petit Prince� features all the necessary equipment for a stay in the south of France: a kitchenette, stereo system for iPod / iPad / iPhone, etc � The Smeg fridge, green anise chairs and ottoman, a sofa and its large flowers on blue background contrast with the simplicity of the timbers, and linen curtains. 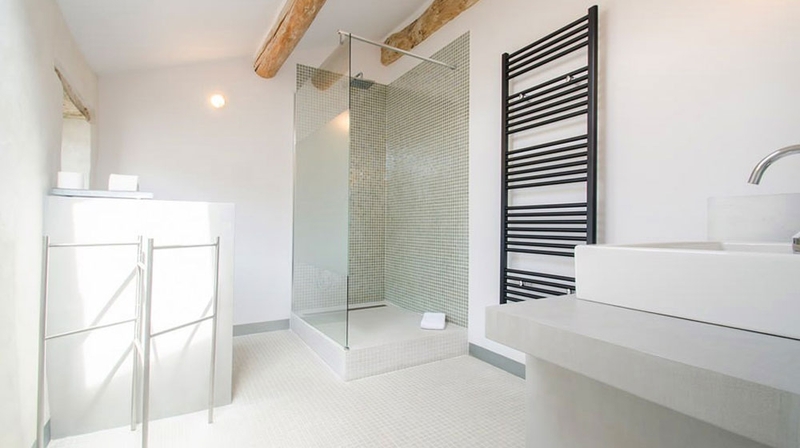 At the end of the room, an old wooden door opens on the bathroom with sleek mosaic walls and a cooling rain shower. Soak up the sun on the terrace with sweeping views of the tranquil Provence countryside. Steam room, free WiFi throughout, air-conditioning. 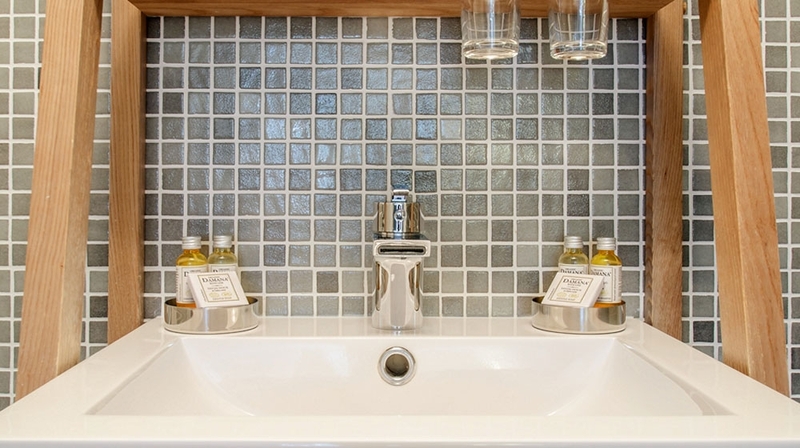 In rooms: Damana bath products. Start the day with a delicious homemade breakfast on the enchanting courtyard, before setting out into the rural landscape for a stroll, cycle or horse ride. For those seeking more relaxing pursuits, the hotel offers a hammam and massage treatments, whilst the heated hotel swimming pool is the perfect retreat. As evening draws in, feast on gourmet cuisine, made from homegrown and local produce, in a romantic starlit setting. After a restful night guests can enjoy a simple breakfast that is put on in the kitchen each morning. The kitchen garden provides vegetables, fruit and herbs and the owner makes home-made jams at breakfast. Delicious table d'hôtes lunches and three-course dinners are served on request (every day except Tuesday evenings from July to September; otherwise on Saturdays) � but be sure to book ahead. There is no bar but wines are available and the owner is more than happy to makes reservations for you at local restaurants. Breakfast is on offer between 9am and 10.30am. 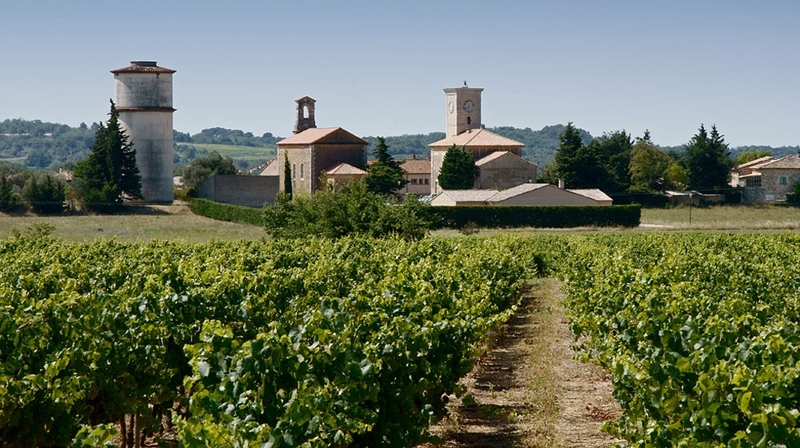 The table d�hôtes is available every day except Tuesday evenings from July to September. The rest of the year, it�s only available on Saturday nights. Guests can upgrade to a buffet breakfast at a cost of 8� in advance, or 13� at the hotel. 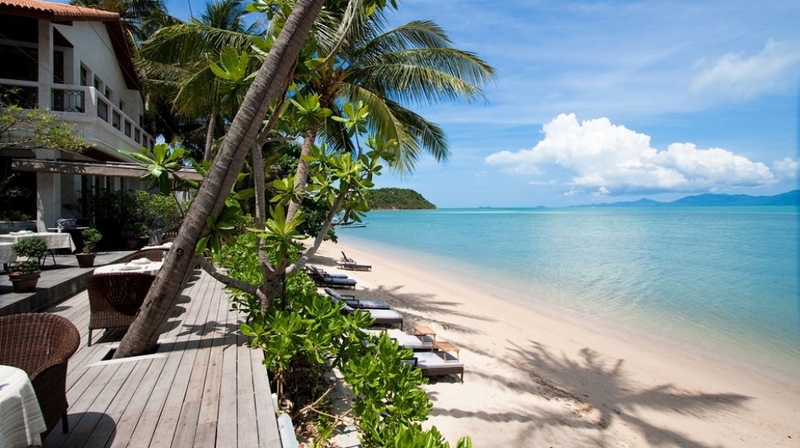 Check-in from: 16h, Check-out until: 11h, Reception from 16:00 to 19:30. By Plane:Fly into Nîmes (40km away), Montpellier (80km away), Marseille (137km away) or Béziers (141km away).